Last week was National Schools Meals Week and up and down the Country, Councillors have been to their local schools to have a meal with pupils and staff. 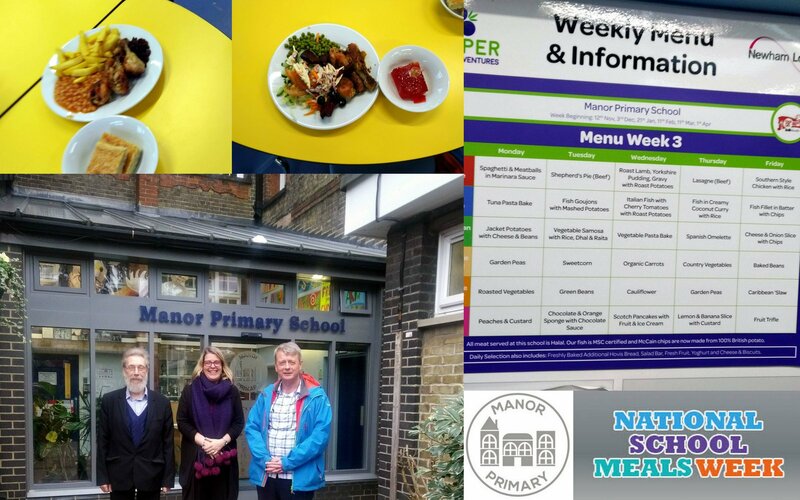 Cllr John Whitworth and I went to Manor Primary School in our West Ham ward and met the Head Teacher, Kate McGee, catering staff and children. It is probably 37 years since I last had a school dinner. We had an excellent meal. I cannot believe that schools have salad bars nowadays. I had a low carb version (save for the red Jelly) while Cllr Whitworth had the chips and cake! No rhubarb crumble and custard anymore (my past school favourite) but thinking about my greedy habits learnt from childhood maybe this is a good thing. Many thanks for the invite and we both really enjoyed the meal and talking to pupils and staff. I cannot wait until next year!